I have written about my Manipur trip before but I think Imphal deserves a seperate post and guide on it own due to its rich history. Also, to be honest, this was the only place I managed to explore properly in that rain-marred trip. I intend to return to the state soon but till then, here is how to explore Imphal if you have just a day in hand. It will be action-packed and you need to start early. A rainy day made the walk difficult. A fecund valley in the middle of difficult hilly terrains is definitely a prized possession. So, the small stretch around Imphal has been hotly contested over the centuries. From the neighbouring Burmese to the seafaring British, nobody has remained untouched by the lure of this land. Even now, the state remains conflict-prone due to various geopolitical realities that are beyond the scope of this travelogue. However, this location has also made it the cradle of one of the most unique and ancient civilizations in India but the remoteness means that very few are aware of it and even fewer people manage to visit it. I reached Manipur after a problematic trip of Nagaland. I also realized that it is the perfect microcosm of the state and it retains the memories of most of the pivotal events of Manipur’s history and so I figured that a day-long walk through Manipur’s capital will be the best way to familiarize myself with the history, society, and culture of Manipur. Heritage walks are organized regularly in big cities like Delhi and they are quite popular too. I could not find any formal walks in Imphal but I decided to devote one whole day to do it myself and I was not disappointed even though I had to walk through a persistent drizzle for most of the times. So, let me take you through the city and familiarize with its historical gems one after one. Inner Line Permits for Imphal/Manipur? Where to stay in Imphal on a budget? Where to eat in Imphal? I had no clear plans for the walk. There were no marked heritage trails and the only support I had was the internet. Nevertheless, a bit of research showed that most of the main attractions were not far from the Youth Hostel at Khuman Lampak Stadium, where I was staying. The nearest ones seemed to be the WWII cemeteries so I started walking towards one of them. Surprisingly, a lot of people don’t even seem to be aware of the WWII action that took place in the Northeastern frontiers of India. In fact, the heaviest battles took place in the hills of Nagaland and Manipur, where the allied forces finally managed to halt the Japanese forces after they had bulldozed through the entire Southeast Asia. Many cemeteries and memorials dedicated to the fallen heroes can be found all over the Northeast. 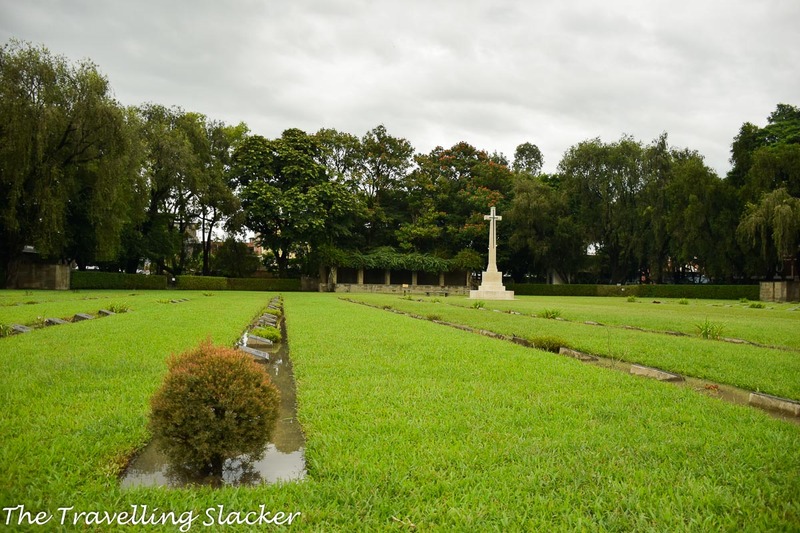 It should be noted here that Imphal has not one but two major WWII cemeteries. I had also seen the cemetery in Kohima earlier, which is prominently located atop a hill and can be seen from miles away. The ones in Imphal are also maintained by the same authority and display similar design. However, they are now surrounded by densely populated residential areas and I had to follow the map on my phone to reach them. The first one I reached was the Imphal War Cemetery. Mainly the US and European soldiers were buried here. As it was still raining, I took a hurried walk around the graves. The names and regiments were mentioned for most of them, but for me, the most touching moment was to spot those unnamed graves. They gave up their lives fighting a war that engulfed the whole world and no one even knows who they were! A similar pattern can be seen in the other cemetery, the Imphal Indian Army War Cemetery, which took another half an hour to reach from the other one. It is located in an even more populous locality and I had to ask around to finally locate it. The difference between this and the other cemetery is that this is dedicated to the soldiers of the Indian subcontinent. There is a cremation memorial here for the Hindu and Sikh soldiers while the graves are primarily that of Muslim soldiers. After the cemeteries, I quickly moved on to the Kangla Fort, the heart of Imphal. The history of Manipur dates back to 1500 BC according to local scriptures and Kangla Fort is the best place to experience the same. It is a vast complex that takes a few hours to explore and there is even a provision of hiring bicycles inside the complex too. To be honest, I was expecting a decaying monument, which is the case with most archaeological remains in the Northeast. However, Kangla turned out to be a well-maintained cluster of monuments that has been freshly restored to its former glory. Most of it was destroyed during the turbulent period of the early colonial era. The Anglo-Manipur war of 1891 saw many violent incidents and the eventual fall of the independent Kingdom of Manipur. Even after the independence, this compound remained a bastion of the Assam Rifles for a long time and only in recent years has it been returned to the people of the Manipur and now I can see a revival of the culture along with the revival of the monuments. This large compound is surrounded by two concentric moats, lined with trees and filled with water that provides brilliant reflections on a clear day. Inside the compound, one can find several old temples, graves, colonial-era cottages, and some newly rebuilt and restored structures, the most prominent ones being the two large “Kangla Sha”s, the mythical dragon-like creatures guarding the land. The other thing that fascinated me was the newly built “Hijagang” (Boat Yard), that stores samples of ancient Manipuri longboats with dragon faces that look like Viking boats. While Hinduism took root in Manipur in the middle ages, elements of its ancient religion and culture can also be visible all over Kangla. The most notable one in this aspect is the pagoda-style Ibudhou Pakhangba Temple. The glorious cultural revival seen through these structures can also be seen in the use of the Meitei scripts all over Imphal. The original Meitei Script was gradually replaced by Bengali script in the 19th century with the advent of the colonial rule. But even that script is now being reintroduced. Most of the local signboards now contain English and Meitei scripts. Colonial buildings now turned into Museum inside the complex. Kangla Fort Complex deserves more time and a seperate post. There were so many things that I will have to return again. In fact, now they have a provision for renting cycles to explore the complex, so you can imagine how big the place is. Also, describing this place is like describing the entire history of Imphal. So, it is neverending. Apart from the ones mentioned above, ythe complex has many othe rmonuments of various shape and size. There are also some colonial era buildings such as Marshal General Slim’s Cottage, Sir Akbar Hydri’s tomb, & the a building which has now become the Archaeological Museum. The Meitei Cuisine is one of the most rich and complex cuisines in India. I have seen several “Manipuri Restaurants” in places like Delhi and Guwahati. However, they seem to be in short supply in Imphal itself. Probably it is such a vital part of the culture that they don’t like to commercialize it. So, everyone suggested only one place called Luxmi Kitchen for an authentic Manipuri Thali and so there I went. It is not far from the Ima Keithel and so it fitted in well with the route and timing of my walk. To be honest, I had no clue about most of the items on the platter but I really enjoyed the meal. But I will try not to describe it and make my ignorance too obvious. After Lunch, I slowly walked towards the Ima Keithel, one of the most famous places in Imphal which is better known as the “Mother’s Market” or “Women’s Market” to the outside world. Every seller is a woman here, selling everything from handicraft to fish, and from exotic fruits to lotus flowers. However, as I visited other parts of the state, I realized that this is not the only such market. Most other markets here are also dominated by women and this trend can be seen in many other Northeastern states too. There are other interesting items scattered around this area too. For example, just outside the Ima Keithel, you will see an intriguing sculpture of a man taming an elephant. This one depicts King Bhagyachandra, one of the legendary kings in Manipur, who was believed to possess mythical powers. Many other such snippets of history can be found all over the city if you are willing to explore. For example, the Shahid Minar (Martyre’s Minaret), located nearby inside a spacious park, is dedicated to Bir Tikendrajit and Thangal General who were hanged by the British on the same grounds after prolonged resistance. Another notable structure at near Kangla is the Nupi Lan Memorial. I had no clue about this one at the start of the walk but it is also located near the Kangla Fort and I stumbled on it anyway. Along with the Ima Keithel, this is another example of the prominence of women in Manipuri society. This is an evocative sculpture depicting the brave women who fought against the colonial forces on multiple occasions. The structure portrays a group of women fighting armed policemen. A bit more walk after the market took me to the state museum and the polo ground. The ground was empty when I visited but it is an important site because the modern game of polo is believed to have originated from Manipuri polo (Last summer I realized in Turtuk that they also traditionally play a similar game in Baltistan, but that is a different story). As there was no action going on on the field, I entered the Manipur State Museum located nearby. It does have some important artefacts and is a good place to get acquainted with the history of Manipur but overall, the place seemed to be in need of some maintenance. Photography is not allowed inside the museum and there were no games that day at the polo ground, so there are no images for this section! I still had some time remaining and the rain had subsided by the afternoon. So, I decided to take a small detour from the city. My final destination for the day was also the most unique one of them all. It is a memorial erected not by the winners of the war and it was good to see something from another perspective. The Maibam Lokpa Ching or Red Hill area saw heavy fighting and the Japanese troops apparently camped nearby. This area is somewhere in the middle, between Imphal, the capital city and Moirang, a small town which is better known for the Loktak Lake. I took a Moirang bound bus from the bus stop near the Ima Keithel and got down at the memorial, which is located by the side of the road and not that hard to locate. Apparently they still keep finding remains of the Japanese soldiers here and there is a plant to build a museum by the Japanese government. As of now, there is a memorial along with a Japanese shrine and a couple of dilapidated machine guns from that war. While the rest of the world does not know much about it, the Japanese do care because I saw a lot of Japanese script on the registry of the visitors. So, my heritage walk ended with an obscure but poignant memorial. It was not a mere walk through monuments and ruins but a walk through several thousand years and through the entire lifespan of a civilization and its various stages. I think a bit of planning and effort can turn it into a very popular walk for the tourists. Imphal airport is directly connected with Guwahati, Delhi, & Kolkata airports. Also, regular buses from Guwahati leaves for Imphal in the evenings and reaches the next morning. It is also well-connected with regular bus sevices with Kohima and Dimpaur in Nagland. I normally take a night train to Dimapur and then a day bus from there. There is no train network so far but there is a plan to connect it with Silchar in Barak Valley of Assam. I don’t know how much time it will take. NO, as of now there is no need for permits to visit the state of Mnaipur, although they are needed for neighbouring Nagaland and Mizoram. Imphal has many hotels, including a couple of luxury hotels and a few regular hotels, most of which can be found in the area surrounding the Kangla Fort. But for the budget travellers, in absense of modern backpacker hostels, the only affordable place I found was the government Youth Hostel at the Khuman Lampak Stadium (my own room with attached bathroom). However, do note that it is a government facility and not exactly a hotel. It depends on availability and you may need to convince the officals and request them. There are rickshaws and buses running through the city. However, if you are new and don’t know the names of the localities, language barrier will create an issue. Anyway, most important places are located around the Kangla Fort and are at a walkable distance. Best option for visitors is to simply check the map and cover the places one by one as I have described above. Also, inside Kangla Fort you can find bicycles for rent. Long distance buses from Imphal can be found at the ISBT, Imphal (Not far from the Stadium where I stayed). On the otehr hand, locla buses and shared vehicles to Moirang/ Loktak Lake leave from a point near the Ima Keithel. It is surprisingly hard to locate a good restaurant in Imphal and even harder to locate a place serving local cuisine. One night I had to survive with biscuits because all the shops were shut down by 7.30 PM, when I went out looking for dinner. The best known place that everyone will suggest is the Luxmi Kitchen, located not far from the Ima Keithel, where you can have the traditional Thali. It is more like a hostel mess rather than a restaurant. The full Thali costs around INR 180. I had no issues in this regard. Most major networks should work here. As a big city, ATMs were also easily available. There are so many areas of India, like Imphal, that I don’t know about. And then posts like this make me realise what I’m missing out on. We are so used to finding WWII cemeteries in Europe, I never knew there were any in India. You taught me something about history I didn’t know. I became fascinated about WW2 when I realized its impact in Malaysia and Indonesia. Then became more aware of so many places that had been affected (including India). Very sad that so many died, especially when they became unknown soldiers. Kudos to Imphal for honoring them with memorials. I think WW2 is a part of history no one should ever forget. This is so interesting. It’s amazing to me just how accurate the term/name World War is. It touched and hurt almost every place some. I like walking through cemeteries to see the dates and names on the headstones. It also makes me sad to see unknown where there should be a name. This is especially true when you know they were so far from home. We have been thinking of touring around Imphal from quite some time but political unrest, makes this plan go to rest forever. Anyways from your post and pictures, Imphal looks super interesting and the Palace is very well maintained. Because of the rain, your pictures are very clean and lit. Thanks for writing this up. Would love to see this land someday. Fascinating. Had no idea about India’s involvement in WWII. It’s interesting how where you live skews one’s perspective of the war. Great remembrance at Imphal for all those involved. Thanks for sharing this. That’s an impressive entry. Those dogs/reindeer? would be terrifying. Wow, had no idea that US and European soldiers are buried there. Curious why their bodies weren’t shipped home. I must be totally ignorant because I didn’t realize India had any involvement in World War II. So it comes as a surprise to me that there would be two cemeteries for fallen WWII soldiers there. 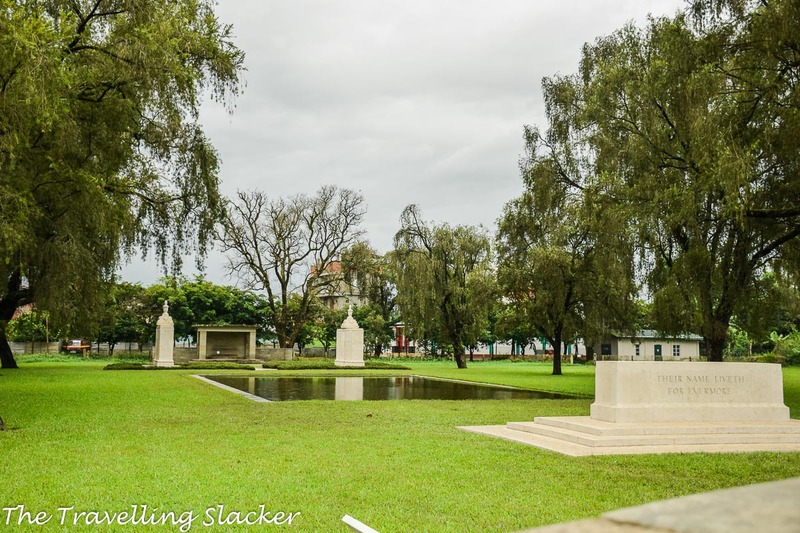 You’ve put together a very thorough description of what to do in Imphal, what and where to eat, and pretty much everything you need to know to make a visit. Thanks! This is a helpful guide on Imphal. It is interesting to know about India’s involvement in WWII. There is so much to do in Imphal. That would be interesting seeing the war memorials. I didn’t realize that about WWII, I need to brush up on my history. Also very cool seeing the dragon boats and the statues.